Allen-Solly brings you friday Dressing office wear that lets you relax. Visit your nearest studio allen solly to find out more. Allen-Solly gift voucher is not encashable. 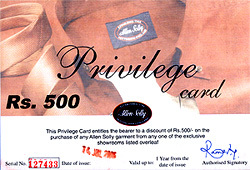 Allen-Solly gift voucher is valid upto 1 year from the date of issue. Allen-Solly gift voucher can not be clubbed with any other offers running at the Showroom. If the bill amount amount exceeds the value of the Gift Voucher, the balance will have to be paid in cash. If the bill amount is less than the value of the Gift Voucher, the balance amount will not be returned in cash. Locate outlets of Allen Solly . . .
Allen Solly popularised the Friday dressing concept in India. It has won the IFA Images 2001 'Best Brand Award' in the readymade menswear apparel category. With the launch of its women's wear in December 2001, Allen Solly has made a successful foray into the growing women's work and casual wear market.